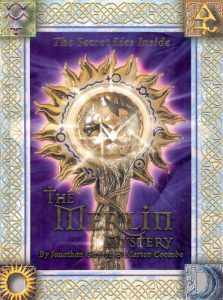 This is Part 2 of my solution to The Merlin Mystery (“MM”) by Jonathan Gunson and Marten Coombe. This post introduces all the important symbols used in the book and my shorthand notations for them. MM is filled with symbols. An important step to solving the puzzle is to be able to recognise them and know which of several different categories they fall into. The most important symbols in the book are the 12 Alchemy symbols, the 12 Zodiac symbols and the 2 “Master” symbols. You don’t need to know anything about alchemy or astrology. The book only uses the symbols to create a code. The Master symbols appear in the top left and right corners on the cover of the book, hinting at their key role. P46 of the book, the “Wand” page, says that the “sublimate of sulfur” is the “master of alchemy”. The other symbol appears on the wings of the butterfly sat on the zodiac on P28,S0 hinting that this symbol is the “master of the zodiac”. These symbols also represent the two main characters in the book, Nimue and Merlin. Hints to this include P28 where the characters have black copies of the symbols next to them, and also Nimue’s clasp on P38. This fits with the idea of Merlin being a master of alchemy. By extension, Nimue the witch is a master of the zodiac. So, I’ll call the Zodiac Master symbol “Nim” and the Alchemy Master symbol “Mer”. The lesser Alchemy symbols are all shown and named on P46. The iron symbol is back-to-front on P46 though not elsewhere. The symbol I use for tin is the Unicode standard. This is slightly different than the one in the book, which looks more like a curly 4. The order of the symbols shown on P46 is important but the names are not. From Mercury, Aqua Fortis, etc to Salt I will call these symbols A1, A2, etc to A12 (“A” for “Alchemy”). This is the “Wand order”. In Part 5 of the solution, we’ll reorder the symbols into a “Spitfire order” and I’ll call the Alchemy symbols in that new order B1, B2, etc. As a challenge, try working out this spitfire order for yourself before reading Part 5. 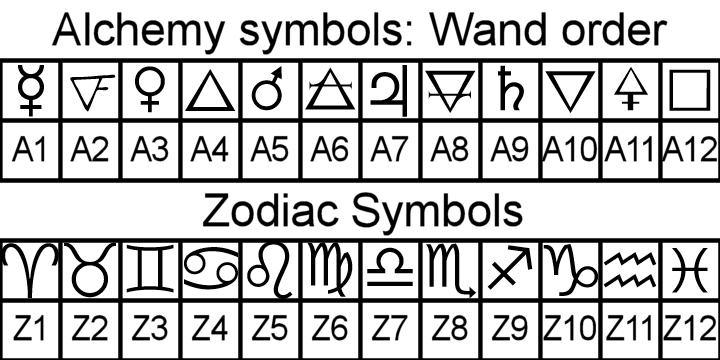 The Zodiac symbols are not all illustrated in one place in the book. P28 contains most of them in a ring around [pornstar] Nimue and there are two small rings in squares S0 and S35. It’s easiest to look them up elsewhere to see the full set, but these images confirm that the order of the Zodiac symbols is their usual order. 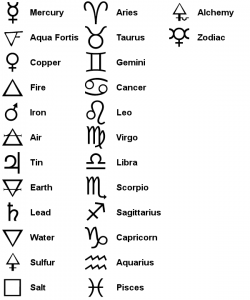 So, from Aries, Taurus, etc to Pisces I will call these symbols Z1, Z2, etc to Z12. The next set of symbols to identify are the 9 Cadency symbols. Cadency is used on coats of arms to distinguish different sons/daughters by order of their birth. Again, you don’t need to know anything about cadency. These 9 symbols appear in “coats of arms” books through MM. Going through MM page by page, the coats of arms books appear in the sequence shown in the image. For example, the book with the sideways “E” in it is on P4,S45. The crescent is on P14,S12. The star is on P22,S20. The martlet, (and please do admire my amazing artwork! ), is on P28, S20. I’ll refer to these symbols as C1 to C9. 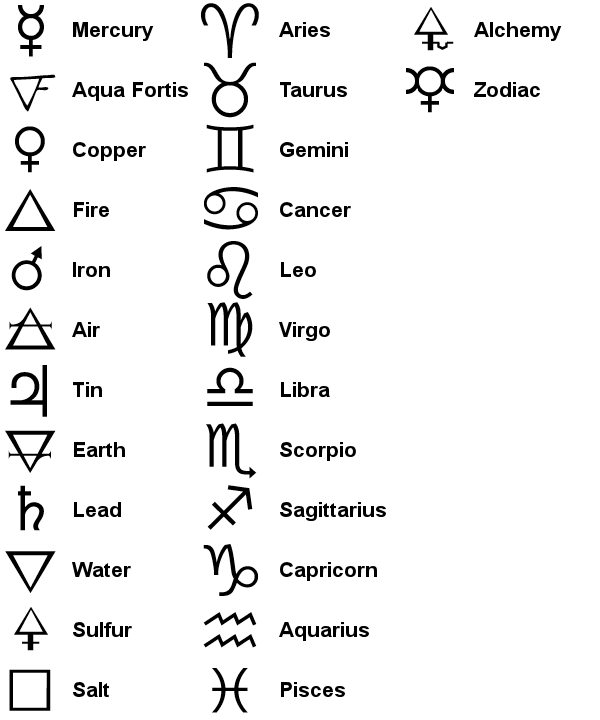 The Alchemy, Zodiac and Cadency symbols appear in different materials or colours. Most of the Nim symbols are silver. Most of the Mer and Cadency symbols are silver or gold. There are small gold Alchemy symbols on almost every page. The gold and silver colouring is important. I’ll preface the symbol name with a G if it’s gold or an S if it’s silver. So, a gold Merlin symbol would be GMer. A gold iron symbol would be GA5 (gold Alchemy five). A silver Fleur-de-lis would be SC6 (silver Cadency six). Hopefully you get the idea! There are also square tiles made of dirty copper scattered around the border on every page. Most of these are etched with Zodiac or Alchemy symbols. To confuse matters, there are also gold and copper pieces which have symbols that aren’t Alchemy, Zodiac or Cadency symbols. Make sure you know your different symbols! Another group of symbols is the 7 solids: pyramid, cone, cube, sphere, cylinder, cuboid and diabolo (which I recreated using POV-Ray). They appear once all together on a shelf on P4, then a few more times individually through the book. The last two important symbols don’t come in large sets. First, there are crescent moons. Every page has several of each of these hidden around the border and scattered across the page. I’ll use brackets to represent these as a left crescent moon “(” and a right crescent moon “)”. Second, there are pointy witch’s hats scattered throughout the book: 3 or 4 of them on every double page except P2 and P44. Most of them are black with a red band on them, but a couple are plain black. I’ll simply call them “hats”. There are also two blue wizard’s hats, but these are red herrings. I’ve made a PDF crib sheet listing the important symbols. It summarises key information about the symbols, their order, values that are assigned to them, and their meanings. It does contains spoilers for what’s ahead, but nothing drastic. You could use it as a guide for things to look out for as you go through MM. See how much you can work out for yourself knowing some of the answers. It’s worth printing out the crib sheet as you’ll be referring to it a lot. The key symbols have all been introduced and named. In Part 3, we’ll identify the different threads of the puzzle. Thank you so much for this. This book completely stumped me despite hours of staring at the pictures. Finally I can get closure!